The High-Performance Endless Pool from Aquasun utilises the same innovative dual-propeller system as our Performance model. The High-Performance model features a 7.5-hp motor and an upgraded pump, creating a more powerful swim current for a more demanding workout. The current created by the High-Performance Endless Pool is smooth, robust and warm. 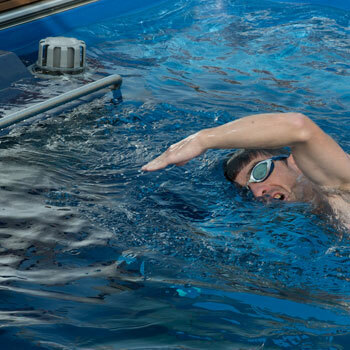 It is easily adjustable, making it a fantastic exercise tool regardless of your swimming prowess. It’s suitable for a gentle, pleasurable workout as a well as a more vigorous, arduous challenge that’s perfect for those in training. All of the Endless Pools that Aquasun provide can be customised to suit any aesthetic or home environments. They can be installed both inside or outdoors and can be used by beginning swimmers, for light aerobic exercise or just for family fun!